Preheat oven to 350°F. Line cupcake pan with cupcake liners. Mix first five ingredients in a large bowl until smooth. Batter will be thick. Scoop one heaping ice cream scoopful of batter into each liner. Bake for 21 minutes. Top of cupcake should feel spongy when it’s ready. Completely cool on cooling racks. Melt raspberry jam in a double boiler until it’s a smooth consistency. 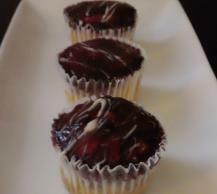 Spread one to two teaspoons of melted jam onto the top of each cupcake. Melt white chocolate in double boiler. Drizzle chocolate over the tops of the cupcakes. Put cupcakes in the freezer for 20 minutes or until raspberry glaze has set.